Math Mammoth was created in 2002 by Maria Miller, who has a Master's degree in mathematics. She decided to start the homeschool math company after tutoring several homeschooled children and noticing the struggles they as well as their parents were having. She also noticed that the curriculum's available to homeschool families lacked the conceptual understanding of mathematics. She decided she could write something better so Math Mammoth was created. 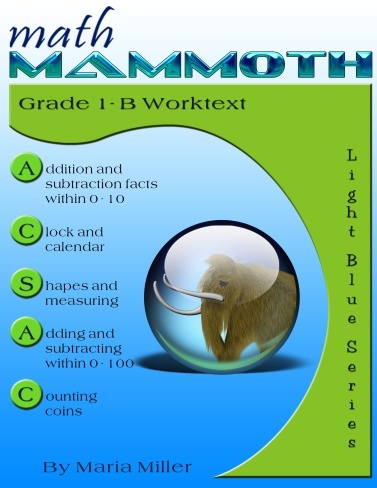 Math Mammoth has two curriculum series Blue and Light Blue. I am always up for reviewing math curriculum's. I have mentioned my fear of math many times on my blog. When we began homeschooling 2 years ago my only fear was math. I knew that despite our very relaxed homeschool style we would most definitely be finding and using a homeschool math curriculum. 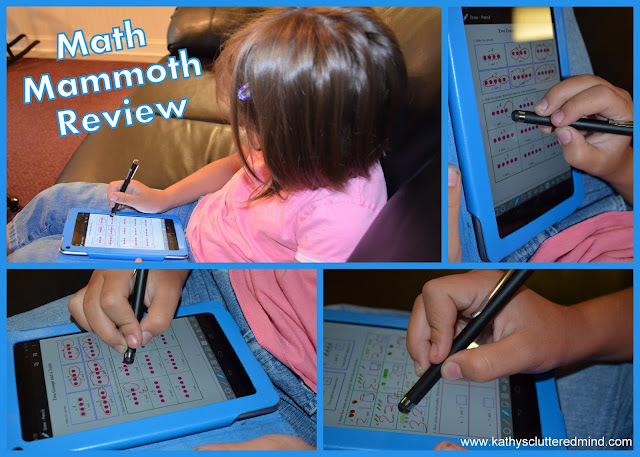 I have reviewed several on my blog and for the last few weeks my daughter has been using Math Mammoth, Light Blue Series. The Light Blue Series is intended for grades 1-6. I had originally hoped to use it with my son who is almost 6 and will be starting 1st (ish) grade this Fall however he had no interest in the worksheet based curriculum (despite even setting it up on the tablet, more on that below). So my super duper reviewer daughter gave it a try (even though she is in love with her current curriculum). She is 7 and will be starting 2nd grade in the Fall. However she is a little behind in math so the 1st grade program worked well for her. We received two student worktexts, teacher editions with answer keys, reviews, tests, money chapter with additional currencies and user guide. A blogger friend recommend Math Mammoth to me last year but honestly it didn't appeal to me because it didn't have everything I was looking for and I wanted a curriculum that would do most of the teaching for me (because of my fear and struggles with math). However I did sign up for the Math Mammoth email list (more on that below) so I have been getting emails each month from Maria Miller...she shares lots of great information and even FREE resources. But when Math Mammoth became available for review I decided I had nothing to loose and signed up to try it out. We have been using it for a few weeks now and my daughter (who does like worksheets) has been enjoying the program. She can accomplish 4-5 worksheets in one day, which makes her feel very proud of herself. The lessons are nice and short and is great for visual and tactile learners. 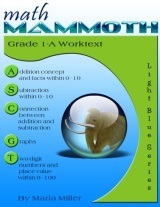 The worktexts (Blue and Light Blue series) are designed primarily for homeschoolers. They are self-teaching, there are no teachers manuals needed (all explanations are in the text). This is probably the only part I dislike about Math Mammoth. Because I struggle and dislike math I personally prefer something that has a little more instruction and does the majority of the teaching for me. This is a personal preference and doesn't mean that this program format is bad. Since I have a 6 and 7 year old and neither are reading I have to sit with them if the curriculum is strictly text/worksheet based and that just doesn't work for us when it comes to math. We received the download version of the light blue series. Because we were going to be on the road most of May I decided to try something a little different. Rather than print the worktext I decided to save it to Drop Box App and then open it on my Android tablet using a great app called qPDF. This app allows you to make edits directly on the pdf and save them as well. This set up made it very easy for us to use Math Mammoth on the go. Additional topics we study in first grade are clock to the half hour (chapter 5) and counting coins (chapter 8). The worktext has all the explanations and instructions on one page. As mentioned above the first 14 pages are a review of Kindergarten work. We skipped over this because my daughter was pretty was already comfortable with the topics. At the beginning of each chapter, there are a few pages for the parents which include a summary of what the chapter covers, teaching suggestions, games for the children which help reinforce the lessons, and helpful internet resources. After the introduction the lessons begin. There are several several topics covered for each concept. And there are several worksheets for each topic. There is not a set amount of pages to work on each day. Math Mammoth makes the recommendation of dividing the number of pages needed to each level by the number of days of school to figure out how many worksheets your child should complete each day (there is even a nifty chart to assist you). Because we are very relaxed I choose to let Gwyn just do however many she felt comfortable with, which was about 4-5 a day. At the end of each chapter there are tests that you can use to check your child's knowledge. Also beginning at the end of chapter two, there are cumulative reviews provided after every chapter in which children can practice all concepts learned up to that point. Math Mammoth is aligned with the Common Core standards as of April 2012. Math Mammoth is a mastery-oreiented curriculum with some spiraling over the grades. There are some additional manipulatives that are recommended to use along with the curriculum. These items are not overly expensive and can easily be purchased at many various stores or even made. Items include a 100 bead abacus, analog clock with movable hands, tens blocks, and rulers. There is also an awesome worksheet maker where you can make additional practice worksheets for your children. This is really helpful if there is a particular concept your child needs to work on more before proceeding. I think Math Mammoth is a good curriculum. It is simple to use and the lessons are short and great for tactile and visual learners. The worktexts are fun and colorful. There is lots of flexibility with the curriculum and it allows children to go at their own pace. There is additional practice available to make sure children fully understand concepts before moving on. Math Mammoth does a great job of providing additional resources to assist parents as well. We will probably keep using Math Mammoth but we will use it more as a supplement. Math Mammoth offers lots of free samples so you can see for yourself if Math Mammoth is the right fit for your homeschool. There are also free placement tests available. Be sure to also check out these fun Mathy the Mammoth coloring and dot-to-dot pages. Sign up for the Math Mammoth tour and take a 7 day virtual email tour around Math Mammoth. You will receive a package of 300 free worksheets and sample pages. 7 individual emails over 7 days that answer most commonly asked questions. And you will get Maria's Math newsletter once or twice a month. I like the worksheets and games they were lots of fun. The worksheets have nice pictures and colors. Math Mammoth full grade sets cost $34 for each grade level. There is also a special bundle pricing of $136 for grades 1-6, $68 for grades 1-3, $68 for grade 4-6, and a CD version for grades 1-6 with 33% discount $141. Math Mammoth also offers individual pricing for families that need to budget the Worktext A is $16.50 and Worktext B is $17.50. There are other options as well like CD and printed copies. Click here for more Math Mammoth from the The Schoolhouse Review Crew.